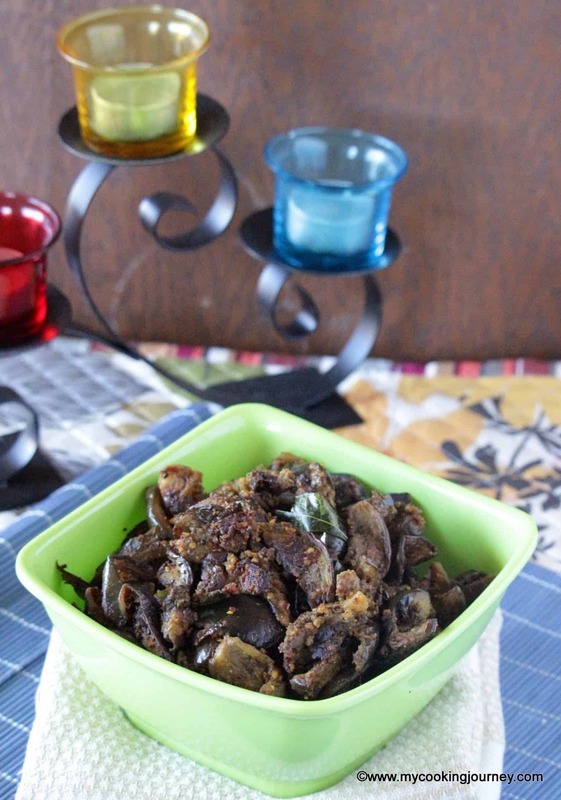 Roasted Eggplants with spices brings out the wonderful flavor of Baingan Bharta. 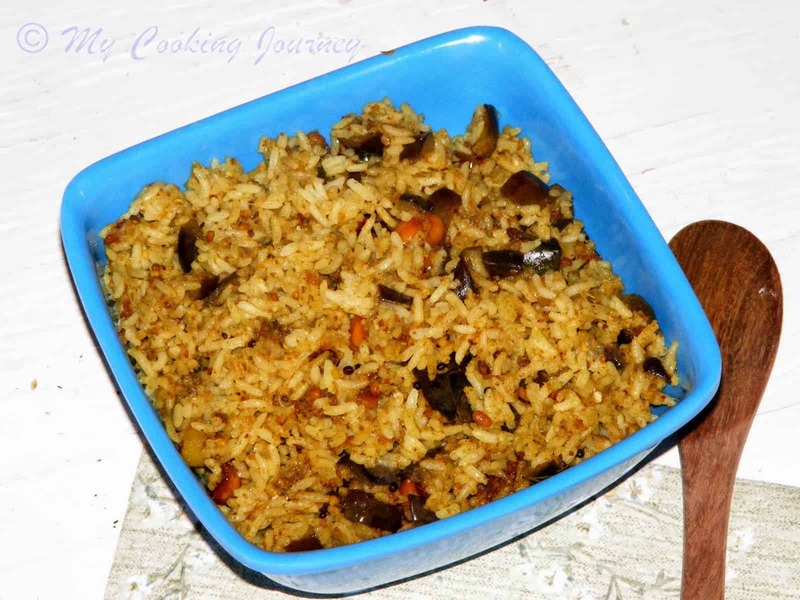 Serve with roti, Paratha or rice and enjoy this Punjabi delight subzi. 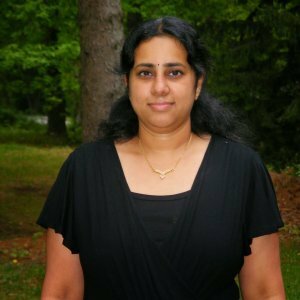 I have been blogging for over 7 years and have more than 700 recipes on the blog. I started with the idea of keeping all my recipes recorded in one place and today blogging has become a passion and profession. This year, I have decided to go back to my old posts and update the pictures. This way I am also performing a quality check on the recipes and follow the old recipe perfectly and male changes if needed. 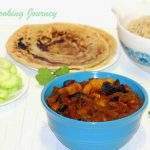 Baingan Bharta is a recipe that I cook at least once a month and even more during summer months when we have abundance of eggplants from the garden. 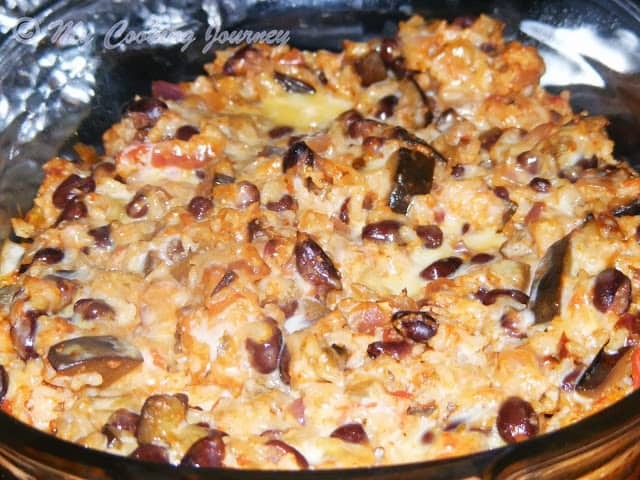 This is one of my very old recipe that still has the picture of the eggplants that we grew in our backyard in 2011. I am still keeping that picture as a memory and updating the rest and also adding step by step pictures as this post was missing that. 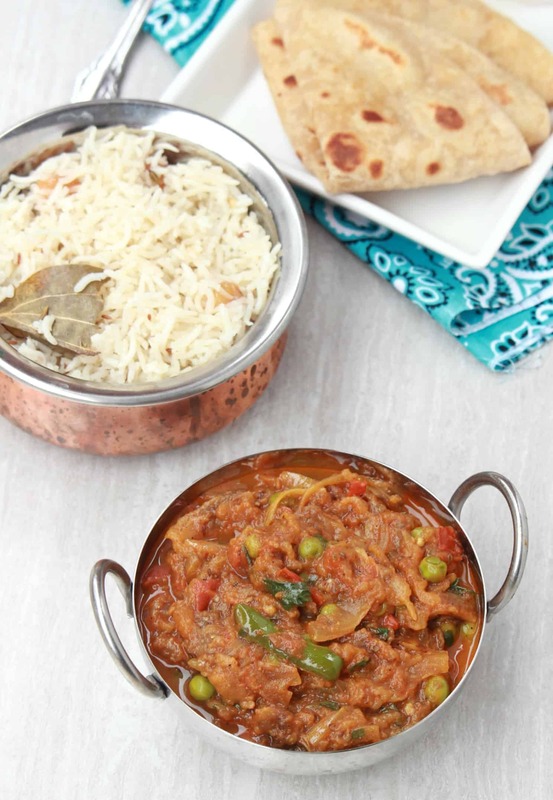 Baingan Bharta, gets its flavor from the smoked, roasted eggplants. The bharta tastes bests when we roast the eggplants on open flame allowing it to char on the outside. 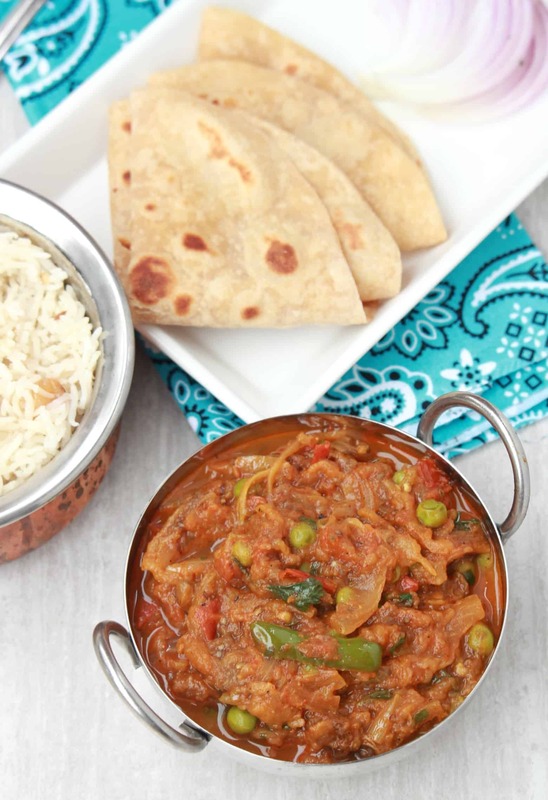 If you have access to outdoor grill, I would highly recommend using that as it brings out the authentic flavor of this famous Punjabi recipe. I roast them on open flame at times and cleaning after that is a task. So many times I just roast them in the oven. The flavor is definitely compromised when compared to the open roasting. I compensate some of it by placing the eggplants under broil mode to get the exterior charred. Keep an constant eye when broiling the eggplants as they smoke intensively and also can burn quite quickly. 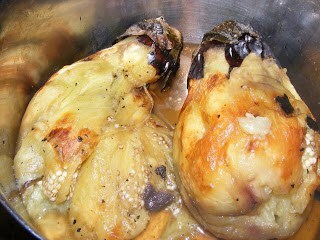 Roasting the eggplant is the main task in maing this subzi. 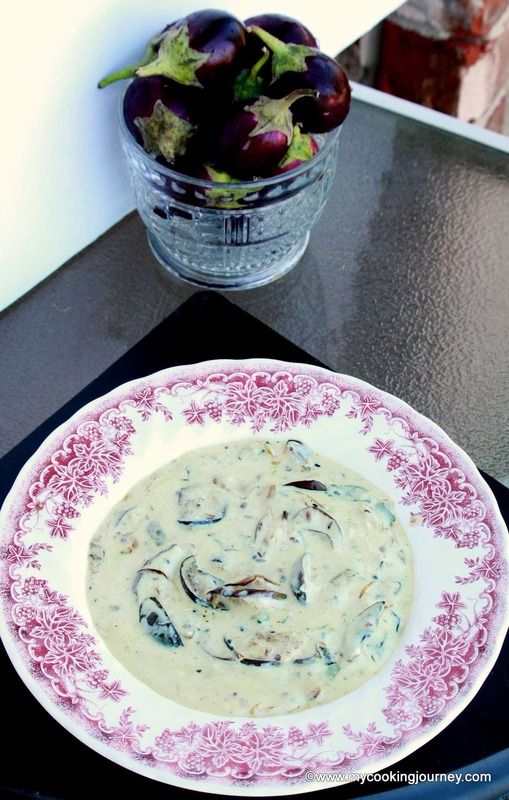 The rest of the recipe is quite simple and comes together very quickly. 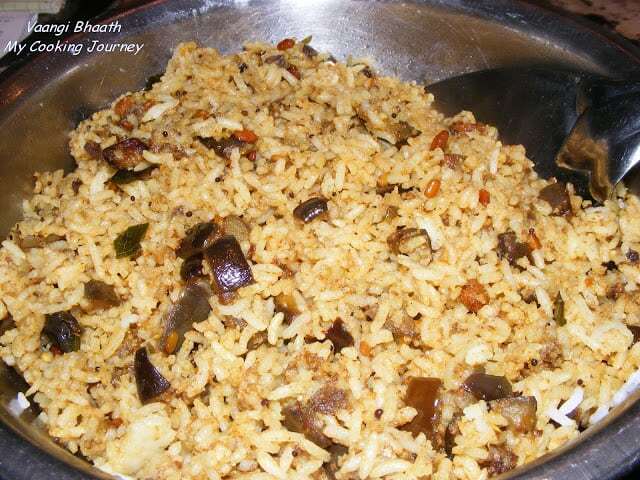 Choose firm, large eggplants to make the subzi. 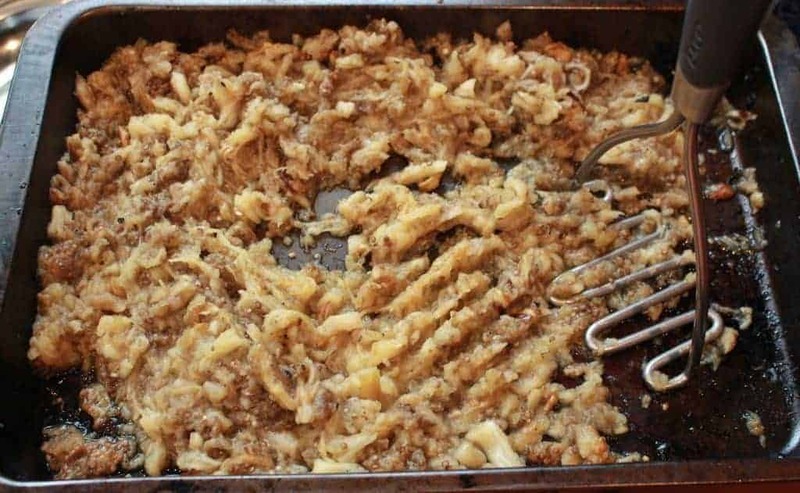 Roast the Eggplants – Wash the eggplants and wipe them with a kitchen cloth. Apply some oil on your palm and rub the eggplant surface evenly. Place them directly on the flame and roast them. Turn them every couple of minutes until every side is evenly charred. You will have a mess around the flame that would require immediate cleaning, but trust me it tastes so good this way that it is worth the effort. If roasting over the flame is not possible (For people with electric stoves) Place the oiled eggplant in an oven safe dish and bake them at 400 F for 20 – 30 minutes. Then place them under the broiler for few minutes turning them occasionally to get the roasted exterior. 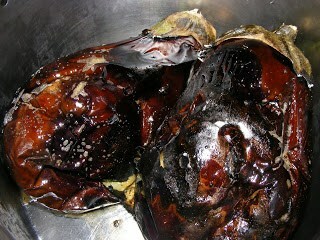 Once the eggplants are roasted, let them cool down a bit and then peel the skin. Cut the top stem and mash them well with a masher and keep aside. Heat some oil/butter and add some cumin seed to it. Next add the chopped onions and sauté them for few minutes. Next add the green chilies and the ginger and fry for a minute. Add all the dry masala powders and salt. Mix well to combine and fry for a minute. Now add the chopped tomatoes and cook until the tomatoes are soft. Add the green peas as well, if using. 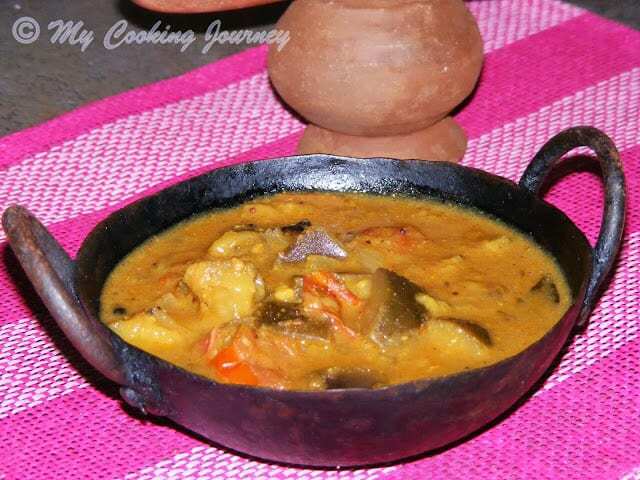 Now add the mashed eggplants and just enough water to bring it to desired consistency. 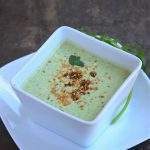 Cook the subzi until it aromatic and then garnish with cilantro. 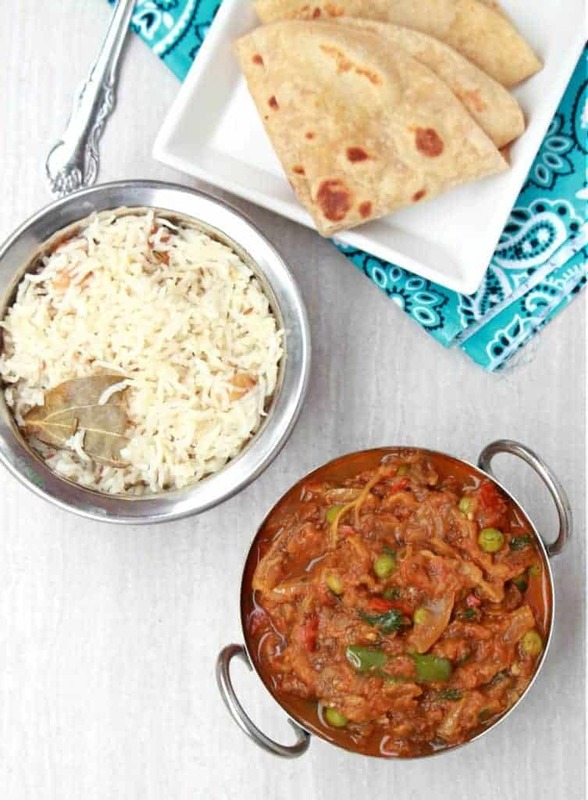 Serve hot with Rotis, parathas or rice. Perfectly cooked baingan bharta ! It was my one time favourite and it is sad that now I am allergic to baingan . The addition of the peas is so much Punjabi .. absolutely beautiful . 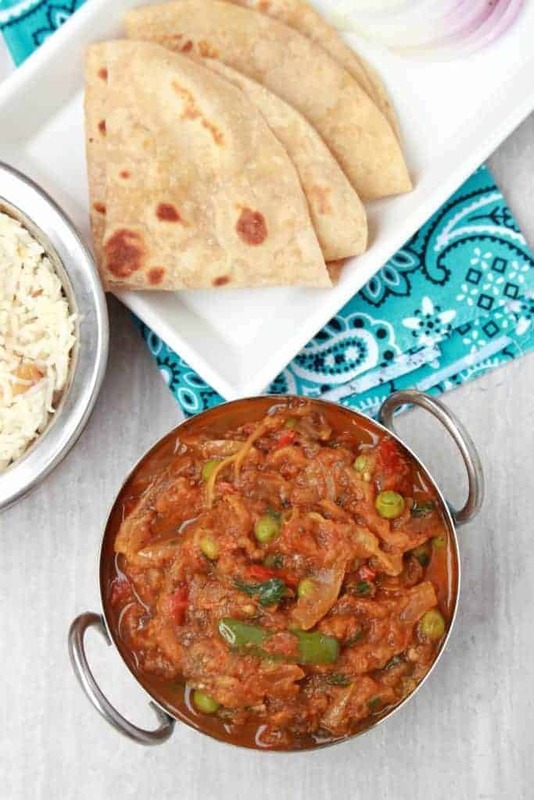 Omg, my mouth is watering, the addition of peas to baingan bharta makes this delicious subzi more catchy and interesting. Awesome clicks. In my ”to try” list for a long time.. This version of yours looks lipsmackingly delicious.. Cant wait to try..
Baigun bhartha is one such thing that every Punjabi loves to have. Delicious…. 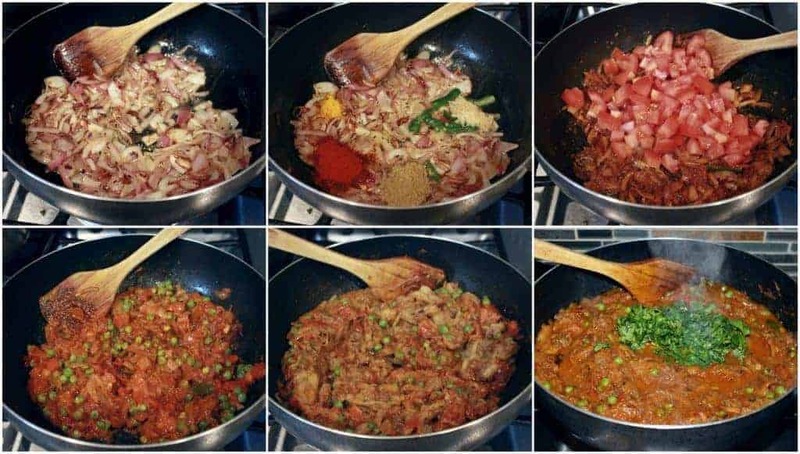 my goodness… feeling like going to jump on the pic and finish this bharta with roti… I loooooooooove baigan bharta.. color is attracting me much… parcel me yar. 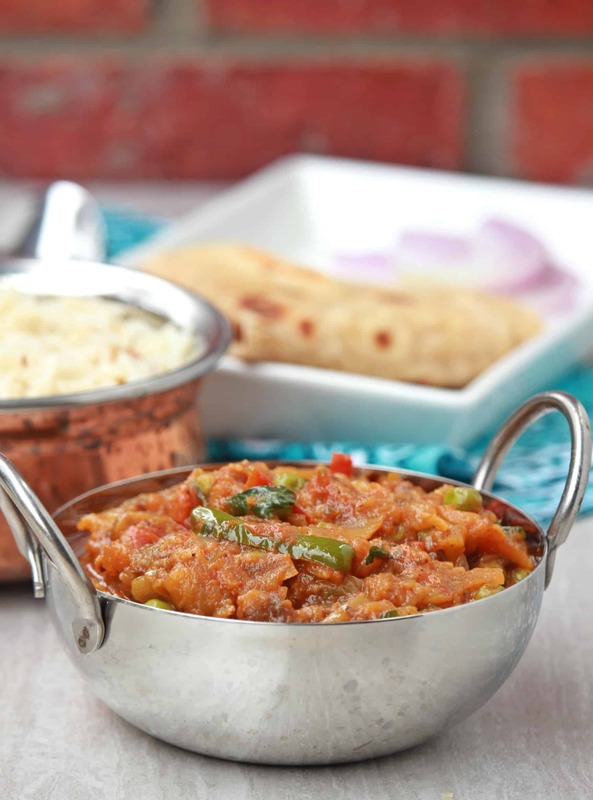 I love bhaigan bharta and you are tempting me to try this one some time soon. Good one. I refrain from making this owing to allergies. I can’t look beyond those beautiful clicks. Very, very tempting. 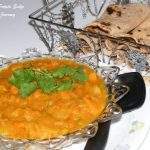 My all time favourite bharta. Looks so delicious and I love the smoky flavor. This bharta is cooked beautifully and looks delicious…great accompaniment for rotis! 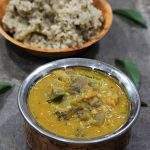 lovely pictures sandhya, the first picture, is so tempting, making me reach to the screen to grab the kadai from the screen.